Chicago's First Ward - Join Our Pact! In previous articles I’ve shown maps that illustrate the relationship between poverty and poorly performing schools. I’ve illustrated how business and political leaders can use these maps to build leadership strategies that make more and better tutor/mentor programs available in specific parts of the city, and in all parts of the city . 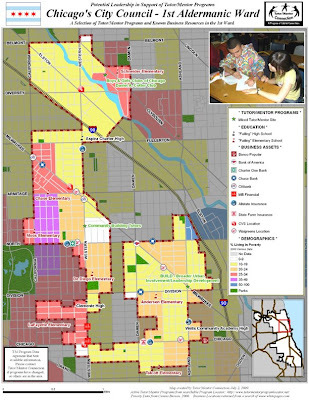 Here’s a new set of maps, illustrating our capacity to map the 50 Aldermanic Wards of Chicago, which then can be used by each alderman to mobilize resources to build tutor/mentor programs in areas where they are needed (or to help existing tutor/mentor programs get the dollars and volunteers needed to survive this depression, and help volunteers stay connected to kids). When you look at my maps, try to locate clusters of failing schools and poverty where students likely need additional tutoring and mentoring. Once you locate pockets where there are likely to be students in need of tutoring and mentoring, use the maps to locate organizations in the neighborhood that could either host new tutor/mentor programs, or help mobilize volunteers, public attention and donors, for existing tutor/mentor programs in the area. 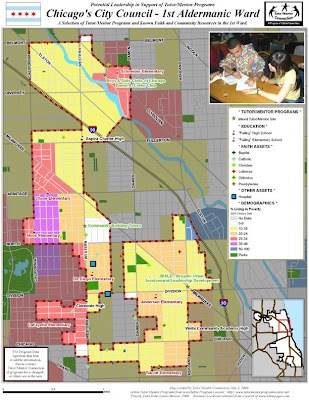 This map above shows faith groups in the First Ward, currently represented by Alderman Manny Flores. Perhaps one of the local churches here can host a new program. Because it's immediately clear, looking at this map, that there is a need. In the First Ward there are only THREE known tutoring and/or mentoring programs that are helping guide resident kids away from hopelessness and frustration and toward becoming an educated and fruitful member of our city. Three programs to support thousands of students who are currently attending the ten schools in this Ward that are on the state's "warning" and "watch" lists due to poor performance. There simply needs to be more tutoring and mentoring support if these students are to ultimately compete for higher education and careers. This maps above shows banks, insurance companies, and pharmacies in the First Ward. Perhaps employees from one of these local businesses can volunteer an hour or two a week to work with a kid who has potential but is lost in an overcrowded CPS classroom each day. Other volunteers might help build web sites, or mentor kids in financial literacy. Some of these businesses could use their advertising to draw customers to tutor/mentor programs in the Ward. Maybe the same business can cut a check or donate supplies or other talents. At the Tutor/Mentor Conference this past week, community, media, and political leaders from Chicago and beyond attended workshops to learn about what we are doing with our maps. This fits a growing trend. Lately, I've been busy talking with similar leaders throughout the country who have come to me curious about whether similar mapping infrastructures can be set up to serve their local students. "Why does no one know about these resources?!" "Why have we never heard of these things?! People need to know these resources are out there!" I shook hands with several community leaders and vowed to form a pact to make this happen. One government official put me in touch this week with Alderman Flores, for whom these maps were made to demonstrate our mapping capacity. This feedback from so many people confirms that our maps are a valuable resource that people in non profits, politics and business can use to help improve schools and lower poverty, and in turn, help kids move to jobs and careers. But I hope this project doesn't end just as it's picking up momentum. I live daily now with the spectre that the grant money that made this all possible a year and a half ago is gone. I'm now officially Mapping For Money to continue Mapping For Justice! Are you concerned about crime? Are you concerned about the future of the city and its economy? Workforce development and failing schools? You read the papers and lament the 9 o'clock news whenever "another CPS student" is shot, right? Look through the Leadership Strategies and other documentation in the Tutor/Mentor Institute, for explanations of how tutoring and mentoring can help underserved youth to get off a path that leads to street violence and poverty and onto one that opens doors to careers. Leaders need to locate where programs are needed most, and which neighboring leaders are available to join this pact, before organizing strategic efforts to build new programs, and while ensuring the existing ones are able to take on more students. A map is the right tool for the job. Look at any of my maps on this blog and see that there are thousands of kids in EVERY district, ward or neighborhood... struggling to catch up in schools that are not meeting their needs. They are failing. They're on the verge of giving up. They need extra help. And I really hope YOU can join this pact with us. "Poverty" and "crime" and "failing schools"? Enough bad news! Let's be a part of the solution. 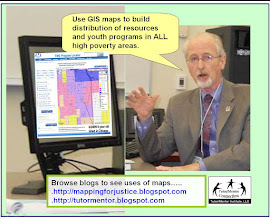 A Donation to this Mapping Cause Brings Needed Support to ALL Programs and Students City-Wide. Because it would be a tragedy if the Tutor/Mentor Connection's mapping program disappears just as it starts really making a visible difference in the lives of everyone.